No man could design one quite so beautiful. Oh yes, Tobias, Muir Woods is a lovely, beautiful part of God's creation. I love to take people who have never seen redwoods there to see them. We are lucky to have them so close to us here in the Bay Area. 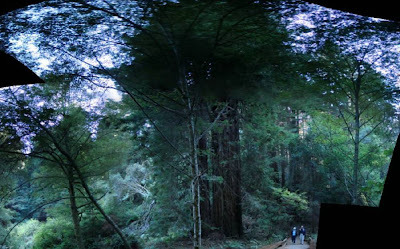 I wanted to take my mom back to Muir Woods, in May '07, "one last time" (she'd grown up in Marin County). But by the time I got out to Northern California to organize the trip, her disease (ALS) was already too far gone: at her insistence, she was bed-bound.